Meditation is one of several relaxation methods evaluated by the National Institutes of Health and found to be of benefit (1). Many cancer treatment centers offer meditation or relaxation therapy with standard medical care. Although it is not used to treat cancer, meditation is a useful complementary therapy for treating chronic pain and sleeping problems, such as insomnia, and for reducing stress and anxiety in both the mind and body. In a controlled study of 90 cancer patients who did mindfulness meditation for 7 weeks, 31% of participants had fewer symptoms of stress and 65% had fewer episodes of mood disturbance than participants who did not meditate (2). 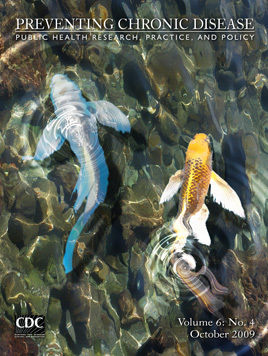 This issue of Preventing Chronic Disease focuses on comprehensive cancer control, and artist Kristen Immoor’s cover design features a serene Koi pond. This image suggests a meditative setting — a quiet place free from distractions to achieve a relaxed state — as well as an object of visualization, a form of meditation in which one focuses on a relaxing image to let go of intruding thoughts. Meditation can be self-directed or guided by doctors, mental health professionals, or masters of different schools, including Zen meditation, transcendental meditation, tai chi, or martial arts. The ultimate goal of meditation is to separate oneself mentally from the outside world by suspending the usual stream of consciousness, and practitioners recommend at least 1 session of 15 to 20 minutes per day. National Institutes of Health. Alternative medicine: expanding medical horizons: a report to the National Institutes of Health on alternative medical systems and practices in the United States (NIH publication no. 94-066.S). Washington (DC): US Government Printing Office; 1994. Speca M, Carlson LE, Goodey E, Angen M. A randomized, wait-list controlled clinical trial: the effect of a mindfulness meditation-based stress reduction program on mood and symptoms of stress in cancer outpatients. Psychosom Med 2000;62:613-622.